A PLANE WAS evacuated at Philadelphia International Airport yesterday over a bomb threat. A letter was received in London about the plane, Reuters reports, which claimed there was a bomb on board. The incident involved a US Airways Boeing 757 flight carrying 157 passengers. An airport spokeswoman told the Associated Press that the passengers were taken off the plane and it was moved away from the terminal to another part of the airport so it could be inspected. 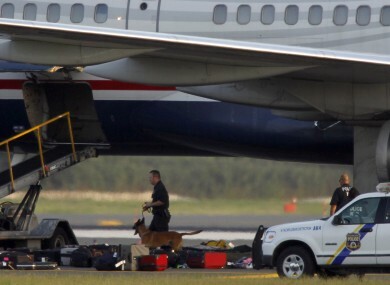 Reuters reports that bomb-sniffing dogs found nothing illegal on the aircraft. The flight was bound for Anchorage, Alaska and had earlier flown to Philadelphia from Glasgow. The threat has been referred to the FBI. Email “Plane evacuated over bomb threat”. Feedback on “Plane evacuated over bomb threat”.